Playing along with this week's Less is More one-layer challenge, code word "Stars." I used Lawn Fawn's Upon a Star set for the foxes, stars, and sentiment. 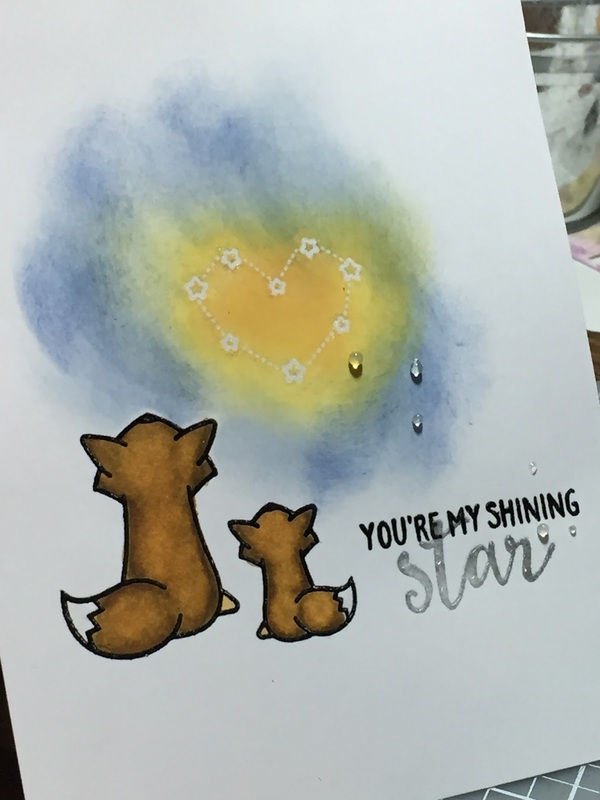 I first stamped the stars with Versamark, then the foxes and part of the sentiment with Versafine and clear embossed all. I stamped the word "star" with Encore silver metallic ink and clear embossed that, too. The foxes were colored with Spectrum Noir markers (I'm still learning which colors work together!) and I smooshed the sky area with distress oxides to create a resist. Finally, I added a tiny bit of Wink of Stella to the foxes ears and tails (can't really see it) and a few crystal drops. Thanks for looking! Cute little scene here, Kathy. Great use of the embossing resist technique for your starry sky. I have this set and almost used it for my OLC. Thank you for joining us this week at Less is More. Thanks, Trina! Hope you get the opportunity to use this set in a challenge sometime so we can see your ideas! So cute ! A fabulous CAS take on our challenge with this lovely scene ! Great colouring too ! Thanks for sharing and for playing along at Less is More ! This little scene is adorable, and lots of great techniques on this one layer too.